But what if her sisters were wrong? Sarah Ockler is the bestselling author of #scandal, The Book of Broken Hearts, Bittersweet, Fixing Delilah, and Twenty Boy Summer. Her books have received numerous accolades, including ALA's Best Fiction for Young Adults, Girls' Life Top 100 Must Reads, Indie Next List, and nominations for YALSA Teens' Top Ten, and NPR's Top 100 Teen Books. She lives in Washington with her husband, Alex. Visit her at SarahOckler.com and find her on Twitter and Facebook. "Don’t settle. . . . You see something, some chance for something great, you take it. You grab your keys and jump on your bike and go, no regrets." I first learn about "The Book of Broken Hearts" last year from the We need diverse books campaign. I seriously should have picked it up then but held off. Big mistake! The story just captured me and I really loved it. I read it all in one day because I couldn't get enough. As a Latina it was awesome to see Spanish spoken correctly in a book and translated correctly as well. Seriously it was done beautifully and I'm also craving some South American food. Empanadas anyone? Speaking of campaigns, where's the campaign on we need more Latin book boyfriends? Cause Emilio Vargas needs to lead the list. lol. "The Book of Broken Hearts" had me in tears and laughing out loud. I really loved the characters, the writing style and all the emotions it caused me to have. I definitely reading more from Sarah Ockler and will highly recommend this book to fans of YA. 5.0 out of 5 starsThis book brought ALL my emotions out! I read this because I thought I would find a great young adult contemporary romance, but I found so much more. I don't think my words will be able to capture just how much I loved this book. Why did I love it so much? This book caused me to FEEL so much emotion. All over the place emotion. I was just as drawn into the emotions of the characters as they were. And even when I finished the book I was still reeling in emotions. I can't stop thinking about this story. Anyone who has known the tragedy that Alzheimer's can be to a family should be able to relate to the dilemma that Jude, the narrator of this story faces. Her father has early onset Alzheimer's, so he is very young to be dealing with the increasingly fast deterioration of his mind that comes with this disease. Jude is only 17, and she is the last of the four Hernandez sisters who are at home, dealing with her father's difficult and sometimes dangerous swings in behavior. 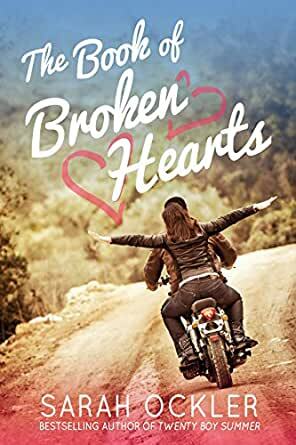 When she sees the light seem to return to his mind when talking about his beloved old Harley, Jude heads to a local mechanic to see if she can hire someone to come to their home and help restore it to its vintage glory. The mechanic recommends Emilio Vargas because he has the skill, but because he is barely trained, he can do the job at the price Jude's family can afford. That would be lovely ... except Jude's sisters have all been burned by Emilio's older brothers in the past, so they all took a blood oath to stay away from the rotten Vargas family. Jude was only 12 at the time, but technically she agreed to stand united with her sisters against these Vargas boys and their "black hearts." But after a little time spent with Emilio, Jude starts to find that this Vargas boy might not be so bad after all. This may seem like a typical sort of setup for a young adult contemporary book, but it is not. This is not a light fluffy read. This is a book with depth that really reaches the heart. Jude's struggle to accept and deal with her father's condition was so heartbreaking at times. As a child of a parent who has problems with dementia, I could totally relate. Luckily I didn't have to face this until I was much older than Jude, so seeing her have to make these tough decisions at her age was difficult. I could relate to her tenacious need to hold onto ANYTHING that brought her father joy and clarity of thought. I could understand her fear of seeking out long term care for him. I could also understand how difficult it was for her to finally come to terms with the fact that he was never coming back to her permanently. All of the problems she faces were so true to real life situations, and my heart hurt for her so much. At the same time I rejoiced in those fleeting moments of clarity when Papi came back to her and shared tender moments of wisdom and history. That relationship between Jude and her Papi may have been my favorite part of this book. It was written absolutely beautifully. I loved it. As for Emilio ... I adored him. Weirdly, until the very end of the book we don't really learn much at all about him, other than the fact that he has the unfortunate last name of Vargas. Normally this would bug me in a story because I would feel as if I didn't get a chance to know the guy enough to care about him as a lead character. But in this case, even with a lack of background history I felt like I knew exactly who this boy was. His actions defined his character in every way. I may not have known what tragedy defined him, but I knew that he loved his mother and treated her with respect. I knew that he was kind to Papi even when he acted strange, before he knew what was really going on with him. I knew that he was extremely patient with Jude, giving her time and space to get herself together when things were difficult. I just loved him. He isn't a cardboard character of that perfect boyfriend material. He has flaws and layers to his personality, but he was absolutely the perfect guy for Jude. Reading along as Jude figured this out for herself was pure joy. This was a very well paced relationship. These two families have Hispanic heritage, and I loved the extra flavor that was added to the relationships because of this. The families were strong but flawed. But through all of the struggles, it was obvious that there was tremendous love in these families. I loved each of the family members who were secondary characters in this story. They added a richness to the story and provided an excellent contrast to Jude's personality and feelings. I thought that I would be reading a typical romance where girl meets boy who she was forbidden to love, girl falls in love with boy, conflict ensues, and then there is a happily ever after. What I found was a sweet, sometimes funny, sometimes heartbreaking, often poignant story of a young woman who is clinging to the past, terrified of the future. This is a story of a girl who learns to face a tremendously difficult reality that is her life, all because of the love of a boy who sees her for who she truly is and who she can become. This story will definitely be one of my favorites of this year, maybe of all time. I am already itching to read it again. I need to FEEL it all again. Five huge stars! Jude Hernandez has to grow up, but it's hard to grow up when she's the baby of the family and her three adult sisters are gone. She also has to deal with her father's failing health, and she hopes that by restoring his Harley, she can bring him back to his glory days. The problem is that her father is not in the best condition to restore a motorcycle, and she is not trained to do it, so they hire the one person who Jude has sworn off for her life due to her sisters' previous heartbreaks. The writing is great. Ockler really knows how to take a difficult subject and help her readers relate to her characters. Pick this up if you're heading to the beach for a weekend. It is a great read. Very likable characters. Super sweet romance. Captivating theme. I loved how Jude grew throughout the story. Her relationship with her daf was moving. And the chemistry w Emilio awesome. I liked this story. I expected that this book would be a nice young adult romance - and it was. But it was also a believable story about the complexities of sibling relationships as well as the crushing grief of Alzheimer's. Well written characters and believable storylines make this well worth your time.